At around 1 pm, we started our local sight seeing in Tata Sumo. First of all, we reached at Srivari Padam which is located at 5 km from the main Venkateswara temple. This temple is located at some height. As we were ascending, the wind become cooler and area become more and more silent. Roads were very good and clean and were covered by trees forming a canopy. One can easily felt the positive energy at this sacred place and it seemed exactly like very pristine place. This place is also called as Srivari Padaalu. It is believed that the Lord descended on the earth very first time at this place and thus left his footprints behind. The Lord's feet are worshipped in this temple. From here, you can take the beautiful Bird's eye view of the temple as well as valley. The view from this place is what appeals me the most. There are numerous folklore related to this place that one can read on internet. The most common one, however, is that after descending on earth for the first time on earth at Srivari Padam, Lord puts a second step at this location of the arch. This is one of the rarest natural arch present in the world out of total 3. Our third stoppage was at Chakra Teertham which is located at around 2 km from the temple and is one of the sacred ponds out of 17 near Tirupati Balaji Temple. The folklore about this place is that Brahma selected this place for observing repentance and thus in order to cleanse it, Lord release his Sudarshana Chakra and this chakra created a pit which came to know as Chakra Teertham. This place is also very .beautiful. Our next stoppage was Swamy Hathiram Bavaji Matt.This place also has a beautiful story behind it. 600 years ago, Bhairagi, the great sage has come from Nagaur from Rajasthan, India to Tirupati He is a great devotee of Lord Balaji. Impressed from the real devotion of Bhairagi, Lord used to come every night to play a game of dices with him. Once, game continued till morning and Lord hurried away suddenly thinking that temple can open anytime leaving his necklace at the Bhairagi place. As the temple opened, necklace was missing from the Lord' statue and also the Bhairagi was also coming to temple to return the necklace. Seeing necklace in hands of Bhairagi, he was caught. Now, Nawab filled the room of this devotee with Sugarcane and asked him to finish that by the next morning and only then, he will believe in his story.Bhairagi prayed to the Lord and the lord appeared in the form of an Elephant and ate everything. For the Nawab it was like any eye opener and he immediately entrusted him the responsibility of taking charge of the temple governance. As the god manifested as Elephant, that is why he has given the name Hathiram; Hathi means Elephant in Hindi. Next was Papavinasam Teertham.This sacred pond has been mentioned in Skandapuranam, Hindu religious text, and it is believed that a holy bath in these waters would relieve one from the sins and brings prosperity and peace. Last one was Akasaganga teertham, located at around 3 Kms north of the Tirumala temple. Akasaganga is a natural waterfall believed to originate from Lord Vishnu's feet. This place is very famous as its water is used for The Lord’s bath every day. 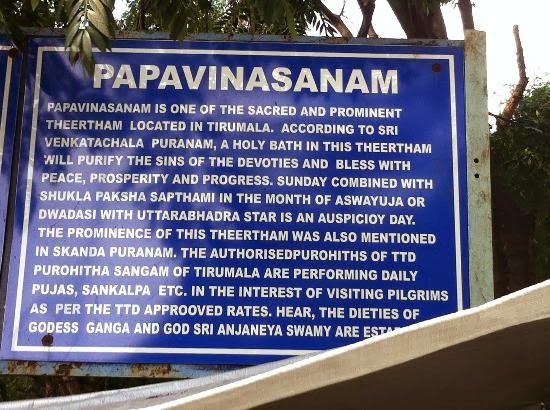 In the olden days, the priestess took turns to carry the water all the way from this part of jungle to the temple in the wee morning hours for the Abhishekam of Lord. . After the TTD(Tirumala Tirupati Devsthanam) came into existence, water lines were laid into the temple and thus simplified. It is also believed here that if you make your house with stones at this place, then your wish of your own house is fulfilled quickly. I must say that the managment was so good that I had never experinced such serene atmosphere at any of the religious places of India. Despite huge rush, one cannot feel it as it was properly distributed. We completed our local sight seeing by 6 pm. Then we went to the local market and did some shopping. Finally, we came back at around 9 after having dinner and thought of getting some sleep as we were really tired. Also, our main Darshan was scheduled for 2 am next day which means we can only sleep for 2,3 hours and not more than that.